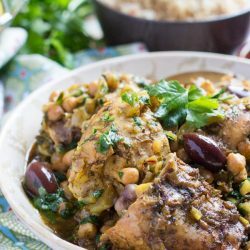 Take a trip to Africa with a delicious slow cooker Moroccan chicken tagine. The tagine comes together in minutes, and freezes brilliantly, so make extra and stash the leftovers in the freezer for another meal. Place the chicken thighs in the bottom of the slow cooker insert. Heat a fry pan over a medium heat. Add the olive oil and onion, and fry for 5 minutes or until the onion is golden brown. Stir in the garlic and ras el hanout. Fry for 1 minute, or until you can smell the garlic and spice mix. Pour the onion mixture over the chicken thighs. Add the chicken stock to the fry pan, and gently heat for 1 minute to deglaze the pan. Pour the chicken stock into the slow cooker. Add the chickpeas, preserved lemon, saffron and olives. Finely chop the bunch of coriander (cilantro), including the roots and stems. Reserve the leaves, and add the chopped roots and stems to the slow cooker. Gently stir to coat the chicken and evenly distribute the ingredients. Stir through the reserved chopped coriander leaves, and serve with wholegrain cous cous. Olives can be a dividing ingredient. Our family loves them, so I always add the larger amount. If only a few of the family members are fans, add the lower amount. If nobody in the family likes olives, omit them completely, and add a little extra salt to the dish if desired. I prefer to use bone-in chicken thighs for this recipe. I find this cut holds up better in the slow cooker, and the bone adds additional nourishment and taste to the dish.